Cancer and aging are generally regarded as irreversible biological phenomena. Might it be possible to reverse these processes? Historically, there have been some reports about such reversion under particular circumstances, indicating the possibility of it, but no systematic analysis or experiment has been attempted so far. We are conducting very creative research on reverse control of cancer and aging through Systems Biology approach to challenge this problem. 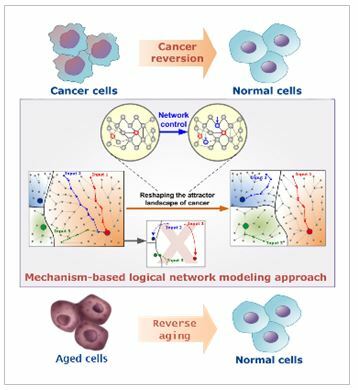 Through extensive large-scale computer simulation analysis of these models, we try to identify molecular targets that can reverse cancer and aging processes and to further test the resulting changes in dynamic features when those targets are controlled. We also carry out experimental validation of the results through both cell and organoid experiments. We are developing computer simulation models for primary molecular regulatory networks of cancer on the basis of biological big data. By mapping individual patient’s genetic variation to our simulation model, we can use our model to finding out optimal personalized therapy. Individually optimized therapeutic strategies are investigated by analyzing the dynamical features of our personalized computer simulation model through supercomputing-based large-scale simulation analysis. Our study suggests a new paradigm for precision medicine. All living-systems are composed of complex networks of their functional subunits and their biological phenomena are determined by dynamic changes of those networks. Therefore, it is indispensable to control those complex networks to regulate the biological phenomena in the way we want. We explore the functions of such biological networks by analyzing both topological as well as dynamical properties. 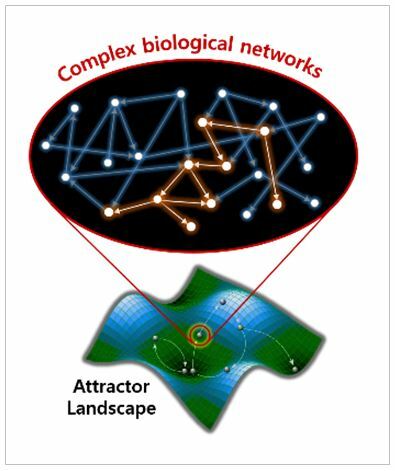 The aim of network systems biology is to investigate the relationship between topological properties and biological function, and to eventually develop practically useful control strategies with which we can regulate the network dynamics. Our brain comprises complex networks of neurons through synaptic interactions and brain functions are induced by the dynamics of such complex networks. For instance, the selective synchronization is a basis for normal brain functioning, so synchrony disruption can cause functional abnormalities that lead to diverse brain disorder. We investigate the physical and functional regulations in brain and principles of those regulations using large-scale computational models of neuronal networks on the basis of multi-modal brain connectome data. 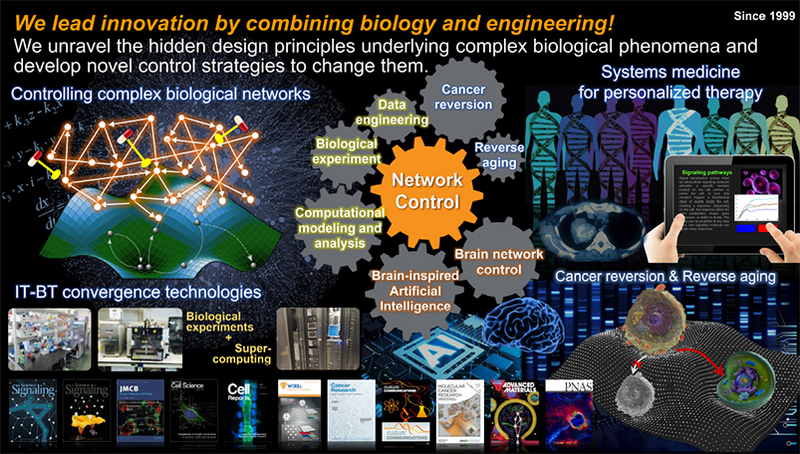 The ultimate goal is to investigate the emergent properties of complex neuronal networks in connection with brain functions and disorders, and to unravel/control the underlying hidden working principles. 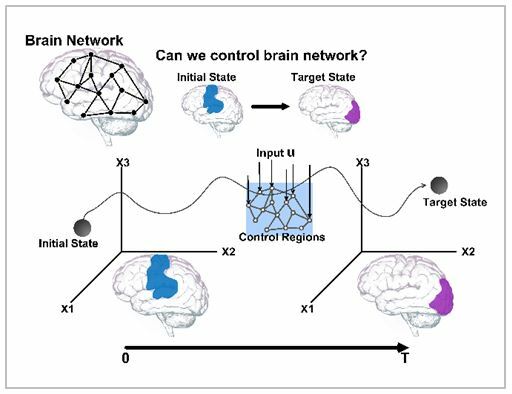 For this purpose, we are constructing real human brain network models based on the human connectome data and developing brain network control strategies to overcome various brain disorders. We are developing a new realm of engineering, named bio-inspired engineering based on Systems Biology, which applies our system-level understanding on biological mechanisms to engineering to find out a novel solution to unsolved engineering problems. For example, we develop self-repairing electrical circuits inspired from biological networks. 1. 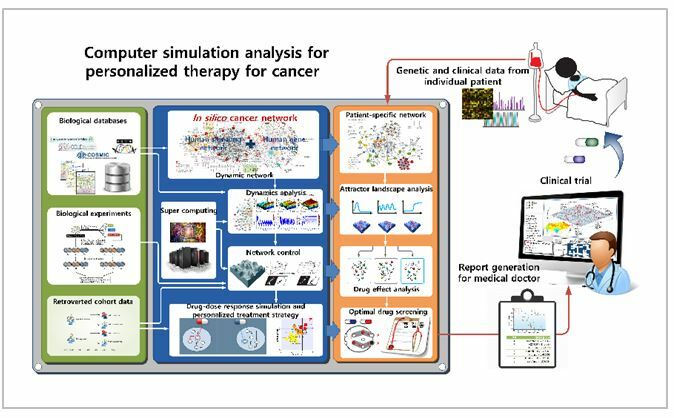 M. Choi, J. Shi, Y. Zhu, R. Yang, and K.-H. Cho, "Network dynamics-based stratification of cancer panel for systemic prediction of anticancer drug response", Nature Communications, Vol. 8, Issue 1, 1940, Dec. 2017. 2. D. Shin, J. Lee, J.-R Gong, and K.-H. Cho, "Percolation transition of cooperative mutational effects in colorectal tumorigenesis", Nature Communications, Vol. 8, Issue 1, 1270, Nov. 2017. 3. J.-K. Won, S. J. Yu, C. Y. Hwang, S.-H. Cho, S.-M. Park, K. Kim, W.-M. Choi, H. Cho, E. J. Cho, J.-H. Lee, K. B. Lee, Y. J. Kim, K.-S. Suh, J.-J. Jang, C. Y. Kim, J.-H. Yoon, and K.-H. Cho, "Protein disulfide isomerase inhibition synergistically enhances the efficacy of sorafenib for hepatocellular carcinoma", Hepatology, Vol. 66, Issue 3, pp. 855-868, July 2017. 4. H. Chu, C. K. Chung, W. Jeong, and K.-H. Cho, "Predicting epileptic seizures from scalp EEG based on attractor state analysis", Computer Methods and Programs in Biomedicine, Vol.143, pp. 75-87, May 2017 (this paper was selected for Editor's choice of the year). 1. J. H. Kang and K.-H. Cho, "A novel interaction perturbation analysis reveals a comprehensive regulatory principle underlying various biochemical oscillators", BMC Systems Biology, Vol. 11, Issue 95, pp. 1-12, Oct. 2017. 2. J. Kim, Y. Kim, R. Nakajima, A. Shin, M. Jeong, A. H. Park, Y. Jeong, S. Jo, S. Yang, H. Park, S.-H. Cho, K.-H. Cho, I. Shim, J. H. Chung, S.-B. Paik, G. J. Augustine, and D. Kim, “Inhibitory basal ganglia inputs induce excitatory motor signals in the thalamus”, Neuron, Vol. 95, Issue 5, pp. 1181-1196, Aug. 2017. 3. Y. Kim, S. Choi, D. Shin, and K.-H. Cho, "Quantitative evaluation and reversion analysis of the attractor landscapes of an intracellular regulatory network for colorectal cancer", BMC Systems Biology, Vol. 11, Issue 45, pp. 1-11, Apr. 2017. 4. K.-H. Cho, S. Lee, D. Kim, D. Shin, J. I. Joo, and S.-M. Park, "Cancer reversion, a renewed challenge in systems biology", Current Opinion in Systems Biology, Vol.2, pp. 49-58, Apr. 2017. 5. I. Yang, S. H. Jung, and K.-H. Cho, "Self-Repairing Digital System Based on State Attractor-Convergence Inspired by the Recovery Process of a Living Cell", IEEE Transactions on Very Large Scale Integration Systems, Vol. 25, Issue 2, pp. 648-659, Feb. 2017. 6. J. H. Kang, H. -S. Lee, D. Park, Y. -W Kang, S. M. Kim, J. -R. Gong, and K.-H. Cho, "Context-independent essential regulatory interactions for apoptosis and hypertrophy in the cardiac signaling network", Scientific Reports (Nature Publishing Group), Vol. 7, Issue 34, pp. 1-14, Feb. 2017. 7. J. Kim and K.-H. Cho, "Robustness analysis of network modularity", IEEE Transactions on Control of Network Systems, Vol.3, Issue 4, pp. 348-357, Dec. 2016. 8. J.-H. Yoon, S. J. Yu, K.-H. Cho, J.-K. Won, C. Y. Hwang (KAIST & SNU), A novel marker for predicting resistance against sorafenib in HCC patients, Korea Patent No. 10-1751929 (June 22, 2017). 9. K.-H. Cho, M.S. Ha, S.-H. Cho, S.-M. Park, H.-S. Lee, H.-Y. Lee (KAIST & SAMSUNG ELECTRONICS CO., LTD.), Method and apparatus for discovery target protein of targeted therapy, U.S. Patent No. 15/196,656 (Dec. 29, 2016). 10. K.-H. Cho, M.-S. Choi (KAIST), A method for predicting drug response based on cancer-cell network attractor dynamics and device for the same, Korea Patent No. 10-2017-0044192 (Apr. 5, 2017). 11. 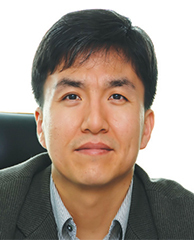 K.-H. Cho, J.-H. Song, D.-K. Shin, Y.-H. Han (KAIST), An optimized anti-cancer drug identification platform for personalized therapy, Korea Patent No. 10-2017-0046796 (Apr. 11, 2017). 12. K.-H. Cho, I. Yang (KAIST), Self-repairing digital device with real-time circuit switching inspired by attractor-conversion characteristics of a cancer cell, Korea Patent No. 10-2017-0047596 (Apr. 12, 2017). 13. 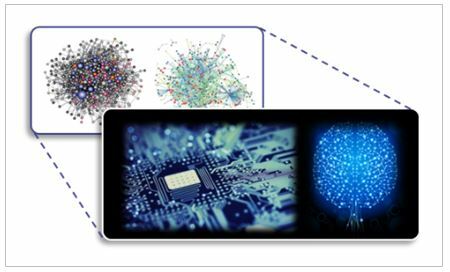 K.-H. Cho, M.-S. Choi (KAIST), A method for predicting a drug response based on the attractor dynamics of the network of cancer-cell and device for the same, U.S. Patent No. 15/715,716 (Sept. 26, 2017). 14. K.-H. Cho, C.-Y. Hwang, J.-K. Won, J.-H. Yoon, S.J. Yu (KAIST & SNU), Sorafenib resistance cancer therapeutic agent, Korea Patent No. 10-2017-0134208 (Oct. 16, 2017). 15. K.-H. Cho, I. Yang (KAIST), Self-repairing digital device with real-time circuit switching inspired by attractor-conversion characteristics of a cancer cell, U.S. Patent No. 15/788,935 (Oct. 20, 2017). 16. K.-H. Cho, H.-S. Lee, S.B. Lee (KAIST), An anticancer agent for treating cancers resistant to PI3K/mTOR inhibitor, Korea Patent No. 10-2017-0157527 (Nov. 23, 2017).